Every week for many years there has been a social meeting around food on Saturdays in the community. The community building, The Barn, had been used for community meals even on a daily basis in the past. These initiatives had often come to a bitter end. During our membership process the cafe was happening sporadically with no coordination. My partner and I valued the opportunity for community members to come together and eat on a regular basis and volunteered to coordinate the cafe and also host a cafe at least once a month on the work day. 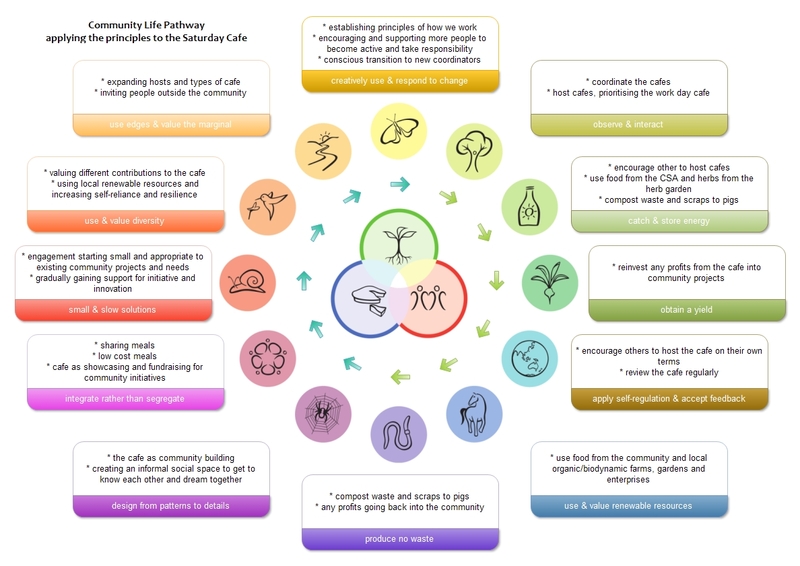 The Saturday Cafe is key to the social life of the community: a place to get to know people, talk about community life in an informal way, building relationships and trust. It is also an opportunity to raise funds. An opportunity to connect community meals with the CSA scheme. 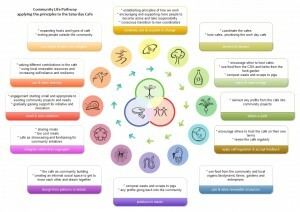 Using the principles of community engagement and design, my partner and I took on the coordination of the cafe to begin observing and engaging in community life. There was a need in the community for coordination of this existing activity and was an appropriate initiative to take on in the observation phase and beginning of our lives at Hoathly Hill. The character of this gathering around food allowed us to get to know people and people to get to know us. For us shared meals are an important part of community life and we wanted to renew this part of community life. We would simply take on the coordination of the cafe, host cafes ourselves, encourage others to host cafes and review the cafe in a year’s time. In our coordination and hosting of the cafe we applied the design principles. We aim to pass on the coordination of the cafe after three years.